The Parkzone Spitfire MK IX. The DIY drone: Build it yourself from a kit. This is a beautiful Spitfire kit, produced by the Z-foam masters at Parkzone. It is full of scale details, like the 20mm cannon, exhaust stacks and cockpit details, including a pilot! 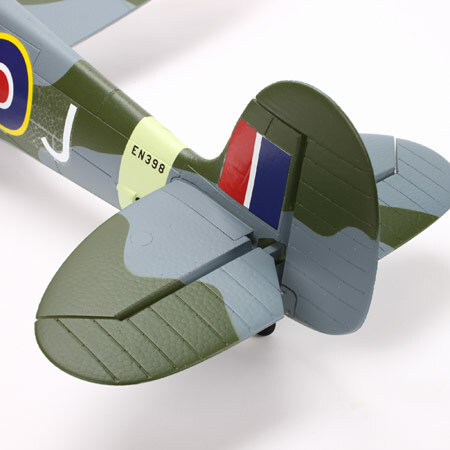 The scale finish is an authentic World War Two reproduction of the Supermarine Spitfire flown by ace Johnnie Johnson. 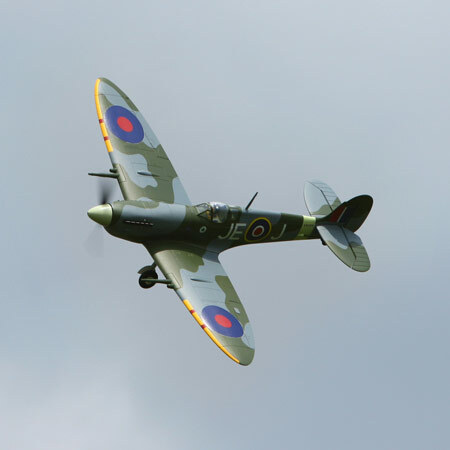 The BNF version comes complete with a Spektrum AR600 DSM2/DSMX receiver already installed and this model spitfire is a 4-channel model, with 4-servos installed. (2-RC servos are used for the ailerons). Power is provided by a 15-sized outrunner brushless motor(950Kv) and an E-Flite 30A Pro Switch-Mode BEC RC ESC is installed. As previously mentioned, construction is from injection molded Z-foam, which gives a tough and durable finish. Minor repairs can be accomplished with foam safe CA or epoxy and as is usual with Parkzone products, a full range of spare RC airplane parts are available. The lipo battery is a 3S 2200mAh 25C type and a 2 to 3 -cell DC variable rate charger can keep things ready to fly. Optional electric retracts are available, that will fit right into the wing. and I think that this is a great option. A Spitfire MKIX flying around with the wheels tucked up looks just terrific! The only thing extra required is a 4-channel (5 if retracts are used) Spekttrum or JR 2.4GHz DSM2 RC transmitter. With a wing span of 43.2", the flying weight comes out to 41.1oz and as can be seen in the video below The Parkzone Spitfire performs scale like RC aerobatics as gracefully as the full-size version! This video is well worth a look and shows some great flying shots along with close up shots that show off the great scale details. I do think that it is a pity that flaps are not an option, but I guess we cannot complain, this is a super scale, great flying, Parkzone Spitfire! 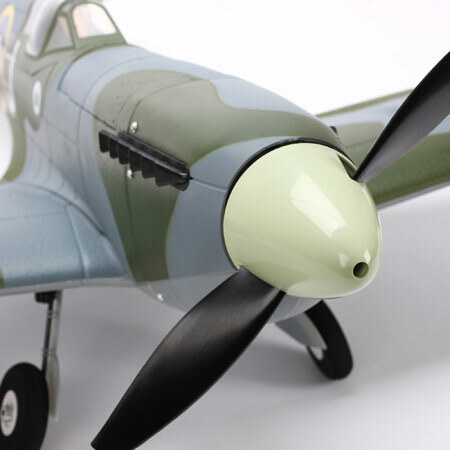 Also available as a PNP (Plug-N_Play) version, without the receiver, battery and charger, this model spitfire will be the envy of your flying buddies. The retracts are fully electric in operation and do not require an air tank or a separate servo. They come complete with overload protection and simply plug into the receiver via the special y-harness that is included. So if your flying field has a nice smooth hard top available, then this makes a great option. Grass runways (unless they are super smooth) are not a good idea for this size of retracts. Make sure that every landing is first class, with no extra bangs and bumps! Also available are a special set of pre-bent landing gear struts, for the Spitfire. The Parkzone Number, of the struts is PKZ5717. The video below, shows the Parkzone P-47 Thunderbolt, but the Spitfire is almost identical and this will show you exactly how to install the retracts. As long as you have a good runway surface and are confident of your landing abilities, then this is a must have option. The beautiful streamlined nose shows some of the very good scale details. This view of the tail shows the simulated ribs on the elevators. Note that the tail is held in place with tape. If and when the tape is removed, then paint will peel off, with the tape! One idea is to place the tape on the underside, so it will not show. Very nice scale appearance and first class paint job. Completely finished-just assemble (about 1 hour), charge the battery and fly! Nice flying characteristics. 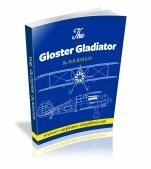 Scale type RC aerobatics are possible. Tends to tip up on take-off and landing-use the elevator to keep things level. A bit on the expensive side. 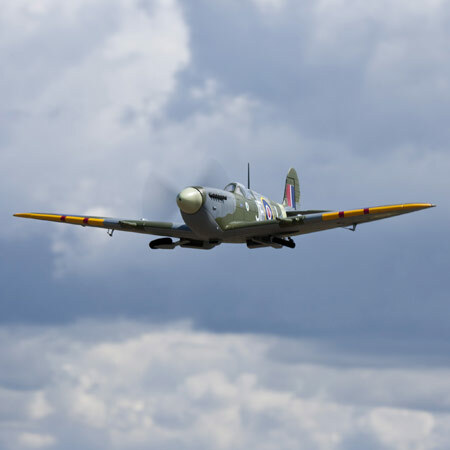 After reading a number of reviews, everyone appreciated the flying qualities of the Parkzone Spitfire MK IX, but noted that it was possible to tip stall that beautiful elliptical wing. Keep the speed up in turns and look out for tip stalls in low speed flight. Nose overs were noted, especially on grass, so keep a touch of up elevator on when taxiing and landing. The overall impression was very positive, definitely a keeper! Sorry to say that this model is no longer available! Don't worry your e-mail address is totally secure. 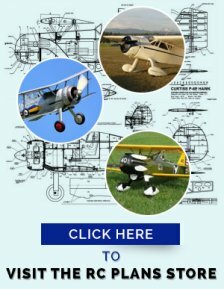 The Pilatus Porter PC-6 is now available as a DIY from plans, with laser cut parts or as a full kit. Can be gas powered (45-50cc and up) or as a true turbo prop. RC Airplane Plans of the Fairey Swordfish.1/6 Full Size. 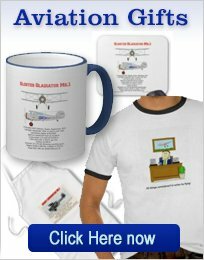 Cad drawn plans of the Fairey Swordfish are available. Complete with folding wings and a scale outline. Electric powered and of a smaller convenient size for easy transportation. Name: Parkzone Spitfire MK IX BNF. Speed Control: 30A Pro SB Brushless ESC-Installed. Radio req'd: 4-channel (5 with retracts) DSM2 or DSMX compatible. Charger: Variable rate balancing DC-included. Approx. Flying Time: 10-12 minutes. Some of the links on this page are “affiliate links.” This means if you click on the link and purchase the item, I will receive a small affiliate commission. There is no extra cost to you. Because my integrity and your satisfaction are very important to me, I only recommend products or services I use personally or would purchase, and believe will benefit my readers. This income is used to help pay for this site. For more information please click here to see my affiliates disclosure document. I am disclosing this in accordance with the Federal Trade Commission’s 16 CFR, Part 255: “Guides Concerning the Use of Endorsements and Testimonials in Advertising"